The culmination of this agitation, failing an eleventh-hour agreement with an intransigent provincial government, will be a three-day general strike by nearly half a million workers on the first three days of December. For a fantastic summary of the actions to date, and the trajectory of this struggle, check out this thorough summary in Socialist Worker. The article suffers a little for being written by an American – for instance, it conflates Quebec’s Liberal Party with the Liberal Party of Canada, when in fact the Quebecois Liberals are far more closely related to the federal Conservatives, and their most recent leader was floated as a potential leader of the CPC – but overall its analysis and level of detail is impeccable. 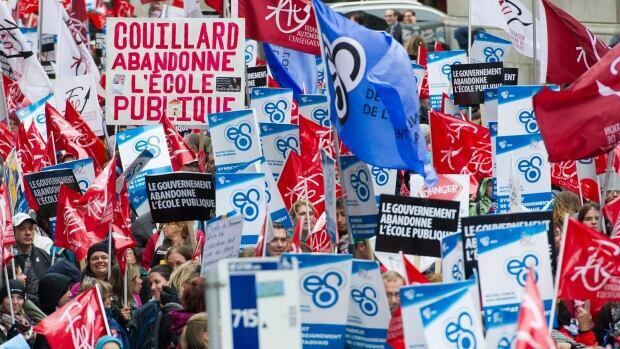 Perhaps the most important aspect for me is the participation of the Association pour une solidarité syndicale étudiante (ASSÉ), the main driving force behind the wildly popular and successful student strikes of 2012. The failure of the student and labour movements to join forces during the printemps érable is, in my humble opinion, a major lost opportunity for fostering a broad-based anti-austerity pro-worker coalition, and the fact that they are quite likely going to be joining forces now is cause for incredible excitement. This kind of broad-based working-class-plus coalition against austerity reminded me of a fantastic must-read piece I read earlier this year, “A Path to Victory Against Austerity in Ontario?” (which I highlighted in an post in relation to the environmental movement). The disruptiveness we need can never be generated from within marginal activist enclaves, mobilizing a few dozen people here, a few hundred there. No, we need tens of thousands, indeed hundreds of thousands of people, coordinated across the public and private sectors, drawing in unionized and non-unionized workers, taking inspiration and in many cases leadership from Indigenous communities, and committing to serious, large-scale economic disruption: shutting down highways, schools, universities, public transportation systems, private and public sector workplaces, and inflicting real costs on the employer class and its underlings (regardless of party affiliation) in government. Specifically, D’Arcy advocates for bottom-up grassroots mobilization within unions and communities to achieve such an end – precisely the kind of structure that ASSÉ employed to such great impact during the 2012 student strike, and which union militants in organization like Lutte Commone (Common Struggle) are pushing during the present union confrontation with the Quebec government. The fact that such a confrontational union action is taking place in what is certainly the most politically repressive province in Confederation is no coincidence. After years of draconian totalitarian crackdown on popular dissent, the people of Quebec have had enough and are willing to go to extremes to ensure that their voices are heard. It’s been over forty years since the last general strike in Quebec – which was a truly radical movement that has been glossed over and erased from Canadian history, and is well worth learning about. The general strike of 1972 ended with repressive back-to-work legislation, massive legal retaliation against rank-and-file union members, and a subsequent weakening of unions’ rights to collective bargaining, as well as the imprisonment of several prominent union leaders. Seriously. Their imprisonment was ultimately ended when a grassroots spontaneous general strike resumed in multiple industrial areas throughout Quebec, pressuring the government to reverse the worst of their repression. What is vitally required today is a strong and durable sense of solidarity similar to the one that was witness in ’72. The plain and simple truth is that austerity has always been within our power to defeat. All that is required is organization and determination. Solidarity with the workers of Quebec! Here’s hoping they show the rest of us lazy Canadians the path towards victory and a more just society. ICYMI Monday is a weekly examination of newsworthy stories that failed to win the news cycle and were thus doomed to oblivion. You can reach me by emailing me at matt@thealfalfafield.com or by leaving a comment below.